Mini Microphone,Megadream Portable Home Studio Condenser Wired Microphone with Desktop Stand and 3.5mm Headphone Splitter Adapter for Telephone/Singing/Vocal/Skype/K Sing Voip/Karaoke-Blue by Megadream at Right Clearing. MPN: CO19BL-1. Hurry! Limited time offer. Offer valid only while supplies last. Are you the next Justin Bieber? Find out with this high quality studio microphone made specifically for recording vocals and acoustic instruments. Are you the next Justin Bieber? Find out with this high quality studio microphone made specifically for recording vocals and acoustic instruments. Sing on you tube for all to hear, or use just to practice before American Idol Tryouts. Get yours today and become famous! Microphone is ideal for everything from studio vocals, use the microphone and included desktop mic stand to podcast over the Internet, create your own audio for video, or record your own songs, to speech, instruments, podcasts, and desktop recording. 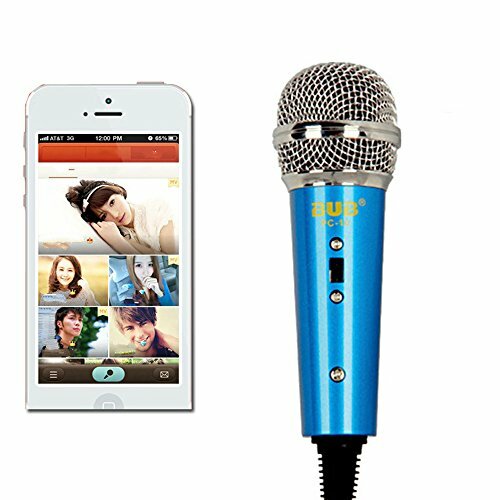 Microphone core: using original BUB super capacitance diaphragm, microphone core capacity exceeding 10MU, to achieve a hi-fi quality, and better recording and monitoring function, let K song more excellent. Finish: Metal body, mini appearance, microphone head using plating technology, surface using temperature coating technology, colorful and delicate, super durability. With 3.5mm headphone splitter adapter, fit for all kinds of smart mobile phones and tablets, such as Apple iPhone iPad Android mobile phones, iOS and Android system, plug and play, no batteries required, just turn on the microphone switch. Noise cancellation: high performance microphone accurately reproduces sound with noise cancellation. Portable and easy to take and use, comes with a professional stand and one sponge, users can speak freely with this hands free. If you have any questions about this product by Megadream, contact us by completing and submitting the form below. If you are looking for a specif part number, please include it with your message.